Breathe+ is a water-soluble blend of the natural essential oils, including eucalyptus, peppermint, camphor and tea tree within a biodegradable sorbitan emulsifier. Breathe+ is a respiratory spray providing symptomatic relief for animals exhibiting breathing difficulties. 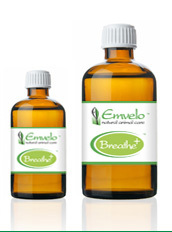 Emvelo Breathe+ helps to liquefy thick sticky mucous and open up breathing passages. Breathe+ is diluted with water using 20ml of product for every litre of water. It should then be applied using a clean hand held or portable spray within the barn, hen house or stable morning and evening for about three days or as required. The product can be applied neat to halters or a few drops to bedding material.